MPR: How many jobs lost due to smoking ban? How many jobs lost due to smoking ban? 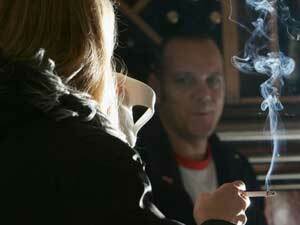 The Hennepin County Board takes up a proposal Tuesday afternoon that would weaken the county's smoking ban ordinance. Some opponents of the county's current total ban on smoking in restaurants, bars and private clubs say the law is responsible for lost revenues and a loss of more than 2,000 jobs. However state unemployment numbers don't necessarily support that claim. Minneapolis, Minn. — Supporters of the Hennepin County smoking ban say the law protects not only the health of patrons, but the health of bar and restaurant employees as well. But critics of the ban argue that protection under the seven month-old ban has cost lots of bar employees their jobs. "We have over 2,500 jobs lost already," says Sue Jeffers. "Over a million dollars in lost revenues every month." Jeffers owns Stub and Herbs bar in Minneapolis. She's part of a very vocal group of bar owners who have spoken out against the Hennepin County ban, before and after its passage. Jeffers, who says she opposes any smoking ban, says the ordinance has led to the closing of at least 40 bars. And she says it's hurting related businesses, like her beer distributor. "They have already eliminated one entire route," says Jeffers. "Which is a lot of jobs, because their business was down 16 percent. It all just adds up over and over and over again." According to state unemployment data, Jeffers is partially right about the impact on bar and restaurant workers. Unemployment claims for people in the food and drink business in Hennepin County have gone up since the ban was passed. But not by thousands or even hundreds. So far in 2005, 18 more claims were filed by county bar and restaurant workers than in 2004. Unemployment claims among hospitality workers also went up in surrounding counties. Ramsey County -- which allows smoking in bars and private clubs -- saw a 5 percent increase in unemployment claims between 2004 and 2005. With the exception of Washington County, the counties closest to Hennepin County -- counties where smoking is not banned -- have all experienced increases in unemployment claims. Some as high as 30 percent. I'm so broke. I don't know that I could get a job that would pay me enough that I could pay off the remaining bills. Steve Hine is the research director at the Minnesota Department of Employment and Economic Development. He says he doesn't have an explanation for the difference in numbers. "We'd want to look at any discernible trends very carefully before we would go out on a limb and attribute any of these to particular events, including the smoking ban," says Hine. Hine says there are several factors that make it difficult to determine what's behind employment trends in the restaurant and bar business. The first is getting comprehensive information on workers. Not everyone who loses a job files for unemployment, and some workers aren't eligible. In order to file for benefits, a part-time worker has to have been employed, anywhere, for at least six months and have earned at least $1,250. Hine says more than three-quarters of the people who work in bars and restaurants are part-time employees. He says many workers change jobs frequently and work multiple jobs. Some say the fact that workers can change jobs so easily means the industry is doing fine, even with the smoking ban. Richard Lange has owned and run the Minnesota School of Bartending for 38 years. Bars, restaurants, supper clubs and VFWs call his school in order find bartenders. And Lange says there's still a demand for bartenders. "We get lots of jobs," he says. "They come in from all over. The percentage is still there as far as jobs. We get lots of jobs, hundreds of jobs." Lange says bars and restaurants will stay in business because people will still want to eat and drink. But he says it appears the smaller bars are taking a hit. Data from the Hennepin County's own economic impact report on the smoking ban shows smaller, neighborhood establishments have generally fared worse under the ban. Matthew Lamphear is the former owner of Molly Quinn's in Minneapolis. He says the smoking ban is the main reason he went out of business. Lamphear says in fact, trouble began for him the first day the law went into effect. "I immediately had a 25 percent drop in customers," says Lamphear. Lamphear says his best customers, his smoking customers, took their business elsewhere. After three months, he began laying people off and closing his doors earlier. Lamphear says eventually he had to close for good after he couldn't afford to pay his bills, and vendors stopped delivering food and beer. His 27 employees had to find work elsewhere. Some, Lamphear says, are having trouble finding new jobs. As for Lamphear, he says he's developed a heart condition and is facing a debt of about $250,000. "I foresee myself pushing a shopping cart, collecting aluminum cans," he says. "I'm so broke. I don't know that I could get a job that would pay me enough that I could pay off the remaining bills." The Hennepin County Board's final vote on the proposal to change the smoking ban ordinance is expected to take place next month.